Pope Francis meeting youths in St. Peter's Square at the Vatican. WITH LESS THAN a week to go, final preparations are being made for the visit of Pope Francis I at the World Meeting of Families in Dublin. 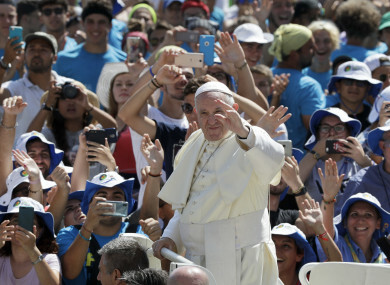 It’s the first time a Pontiff will have visited Ireland in almost four decades, and hundreds of thousands are expected to turn out to witness the historic event. To help everything run smoothly, the World Meeting of Families put out a number of calls for volunteers to do various jobs. Katie Crosby of the World Meeting of Families told TheJournal.ie that volunteers for the event would work in one of 14 different areas. “We have 7,000 general volunteers involved in various roles,” she said. Volunteer categories include a meet and greet team for pilgrims arriving to Dublin for the event, a translation team for those who want to hear services in different languages, and a transportation team to help pilgrims get to different events. A number of people will also provide medical care, while the largest team, including ushers and stewards, will ensure everything runs smoothly when events take place. “We also sought volunteers to offer accommodation for overseas pilgrims in family homes in the Dublin area under the ’Host a Pilgrim/Family’ programme,” Crosby says. Volunteers and staff are already working at the various sites hosting World Meeting of Families events. Last week, a number of volunteers made up 44,000 bags at a warehouse in Dublin to be shipped to the RDS for the opening ceremony on 21 August. The team also dealt with more than 3,000 vestments ordered especially for the occasion, as Crosby explains. Others have also baked cakes, while one person will also don a sheep outfit to act as the event’s mascot Éirinn. Those still looking to lend a hand, however, will be left disappointed. In other words, all that’s left to be done is to wait for the arrival of the Pope next Saturday. Email “Mascots, bakers, and ironing mammies: here's what the 13,000 papal visit volunteers will be up to”. Feedback on “Mascots, bakers, and ironing mammies: here's what the 13,000 papal visit volunteers will be up to”.